Three words. One day. Many voices. #IWILLLISTEN Day in Philadelphia is a collaboration to raise awareness and fight the stigma surrounding mental illness. On June 3rd, we will take over LOVE Park for one day and one night, to host a citywide conversation about mental health and wellness. Join us by promising to listen to your fellow Philadelphians with an open mind, and without judgment. About 400,000 Philadelphians are directly impacted by mental illness each year. These are our friends, family members, colleagues and classmates; and many of them don’t seek treatment for their issues because of the stigma associated with mental illness. This needs to stop. Philadelphians need to know that they can seek care and get on with their recovery without the fear of stigma. They need to know that their city will listen to their needs and respond with the support they need. That’s why the Department of Behavioral Health and Intellectual disAbility Services has chosen to partner with the #IWillListen campaign to make Philadelphia the first city in America to host an #IWillListen Day. 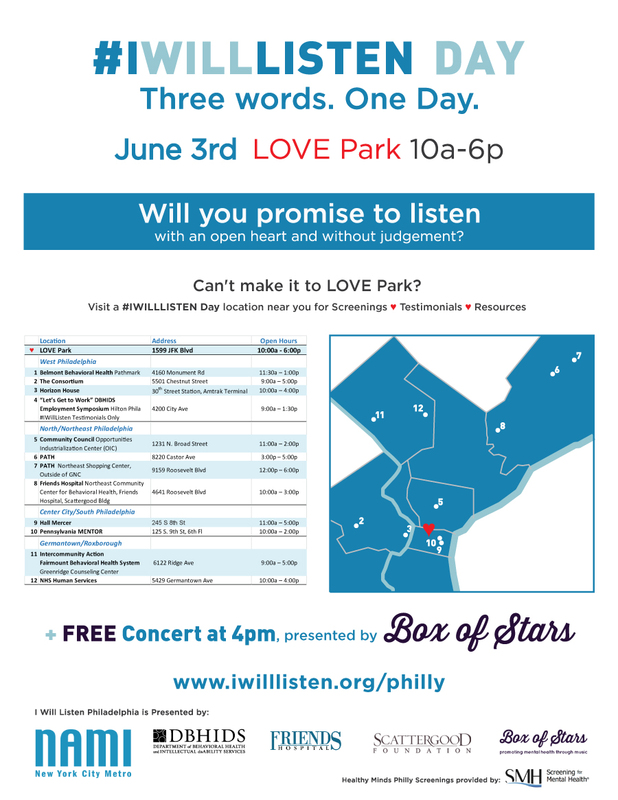 This day, June 3rd, will bring together Philly’s public, corporate, academic and nonprofit communities in LOVE Park to each make a promise to listen with an open mind and an open heart to those experiencing mental illness. Join us on June 3rd to let your friends, family and community know that you will listen! IWillListen.org.